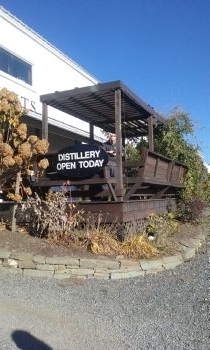 .... we went to a local distillery today, that is attached to a fabulous Apple Orchard and Farmer's market. My sister bought some gifts there, and we were pleased to find Banana jam and Rhubarb Jam. When mixed together, it makes the MOST AMAZING spread. Don't believe it? We even gave it a name.... Rhabuban. It's a thing. 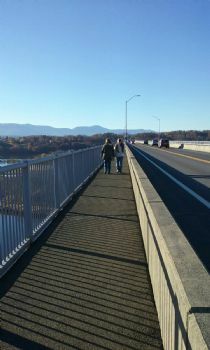 .... we finally went and drove to the Rip Van Winkle Bridge in Hudson to walk across it. I always wanted to do that. We knew we needed the minutes for our Shooting Stars, and we even took hubby along, who took some pictures. We ended up with over 2 miles! It is nice to see that there were hotline telephones on both sides of the bridge. Every year, people jump off that bridge to take their life, and I had no idea there are signs of hope and offers to help posted right there!!! 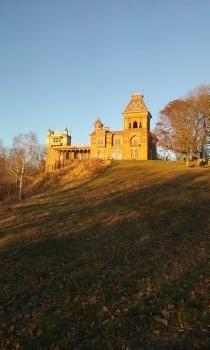 .... we drove up to Olana, a little castle that artist Frederic Church designed and built as his studio overlooking the Hudson river. We got there when the evening sun turned everything into a warm glow. 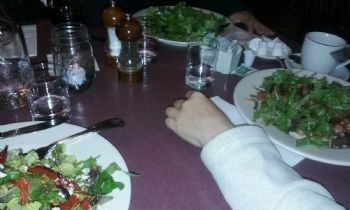 This was an amazing day, and we ended it with a meal at my favorite Italian restaurant, where everything is freshly made, organic and tasty. No artificial anything is served at this place. We ate too much, but we have plenty of leftovers for tomorrow. Are you on vacation? 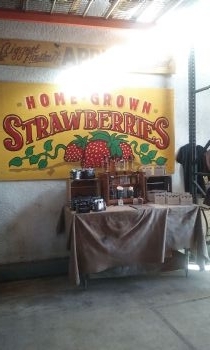 I had to laugh when you mentioned the distillery and that you bought jams ;) I thought they were in the market of alcohol! I never heard of banana jam. I hope you and your sister are having a great time. Hey there! Is your sister on SP? Doing the 5% Challenge? How cool! I used to have two sisters who did the 5% with me. That came out weird. I still have two sisters. They just aren't in the SP Community any more. It looks like a wonderful day. I love being a tourist in my local area. What a super day!!! Look like you had terrific weather to go with it. I'm glad that you are having such a great time with your sister here. How long will she be here? Not long enough for you huh? Take care and enjoy your time.